FILE - Britain's Prince William and his wife Catherine, the Duchess of Cambridge, arrive at Ayers Rock Airport in Yulara, central Australia, April 22, 2014. When the Duke and Duchess of Cambridge arrive in India on Sunday, on what's being called their most ambitious tour to date, they'll encounter much of the starry-eyed giddiness they're used to along with a hint of nostalgia harkenning back to a 1992 visit by the late Princess Diana. Prince William's mother created a media firestorm during that visit when she posed alone for a photograph in front of the Taj Mahal, the ivory-white marble mausoleum known as a monument to love because it was built by a Mughal emperor to entomb his beloved wife. Newspaper headlines crowed suggestions about Diana delivering a hidden message about the end of her marriage to Prince Charles. And the photo, as well as her close relationship with Mother Teresa, helped make Diana hugely popular in the country. But India, despite its fractious past as a part of the former British Empire, has always loved reading about the British royals, especially the Duke and Duchess and their young children. They will not be taking their children, Prince George and Princess Charlotte. "There will be a lot of interest and a lot of coverage, but it's mostly going to be about pretty people and pretty pictures,'' media analyst and columnist Santosh Desai said of the upcoming visit, which begins Sunday in Mumbai and includes stops in the capital of New Delhi, a wildlife reserve in the eastern state of Assam, the Taj Majal in Agra and even the neighboring country of Bhutan. "I'd be very surprised if there was anything more substantive or even interesting about this,'' Desai said. Already, local news reports are speculating about what the Duchess of Cambridge, formerly known as Kate Middleton, will wear during the visit. Will she patronize a local designer as she has on other foreign visits? Will she wear an Indian outfit to better cope with the sizzling April heat? "Photos, photos and more photos. It'll be silly to think that there will be any deeper significance to the visit,'' said Shailaja Bajpai, media critic with the Indian Express newspaper. Cricket legend Sachin Tendulkar and Bollywood actors - modern India's version of royalty - including Shah Rukh Khan and Aishwarya Rai Bachchan are among the VIPs invited to a grand ball with the royal couple in Mumbai on Sunday night. The royal couple is also expected to visit Mumbai's iconic seaside Taj Palace hotel, which was one of targets of armed gunmen who killed 166 people in the city in 2008. They will lay a memorial wreath and meet staff members who helped protect guests during the attack. They are also scheduled to watch a cricket match in the city, and to meet with children from a local slum and members of several children's charities. The couple's schedule has them set to travel next to New Delhi, where they are expected to pay their respects to freedom fighter Mohandas K. Gandhi, who led a peaceful campaign for independence from Britain and was assassinated in 1948. They will also visit the India Gate war memorial in the heart of the crowded capital, and have lunch with Prime Minister Narendra Modi. In a nod to William's conservation efforts, the couple will next travel to Kaziranga National Park in the eastern state of Assam. The park is home to two-thirds of the world's population of Indian one-horned rhinos as well as endangered swamp deer. From Assam the royal couple will head to the Himalayan kingdom of Bhutan at the invitation of its own royal couple, King Jigme Khesar Namgyal Wangchuck and Queen Jetsun Pema. The duke and duchess, who routinely showcase their athletic skills, will also hike several hours to visit a 1692 monastery called Paro Taktsang, or Tiger's Nest. FILE - The Taj Mahal attracts millions of visitors each year. 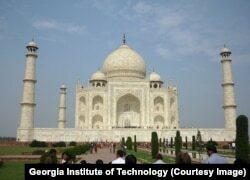 The couple plans to wind up the tour with a closely-watched tour of the Taj Mahal, in the north Indian city of Agra. "He feels incredibly lucky to visit a place where his mother's memory is kept alive by so many who travel there,'' the Cambridges' communications secretary Jason Knauf told reporters ahead of the trip. It is unclear if the couple will pose for photos at the same bench in front of the medieval monument where his mother was photographed smiling shyly for the camera.